Summer might be coming to a close but there’s still time to enjoy the fresh berries that the season has to offer! Today’s cake is a great way to do just that. It’s a fresh and vibrant take on the oh-so-popular rainbow cakes! 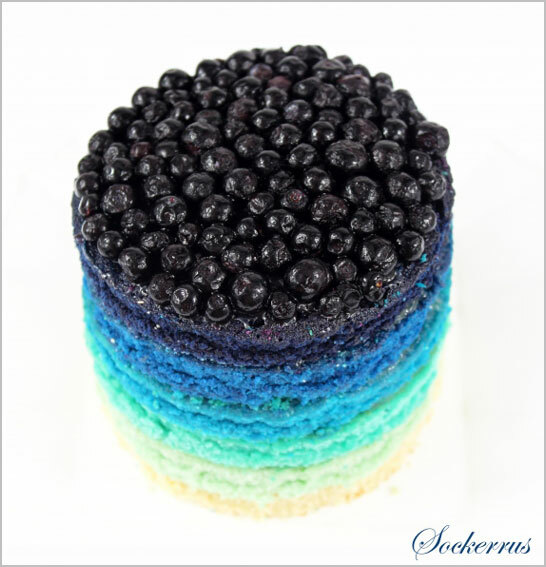 Shaded blue, filled with lemon curd and topped with berries, this cake is the perfect combination of blueberry and lemon. 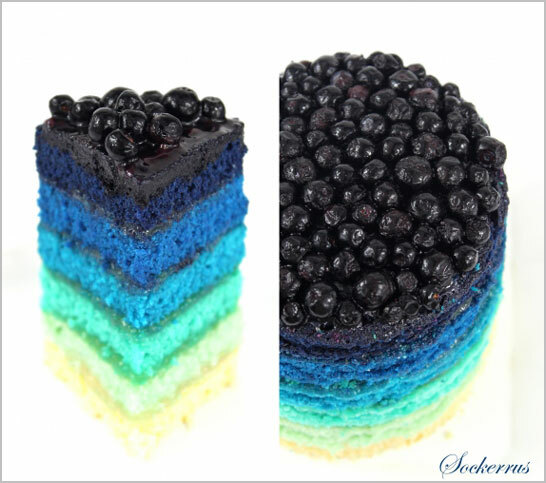 A treat for both your eyes and your mouth, check out this Blueberry Rainbow Cake created by Lisa Lundqvist of Sockerrus (a Swedish blog named Sugar Rush)…. I absolutely love the bright blue building into the deep dark blueberry top! You could also do this cake in shades of pink, topped with raspberries for a gorgeous lemon and raspberry creation! 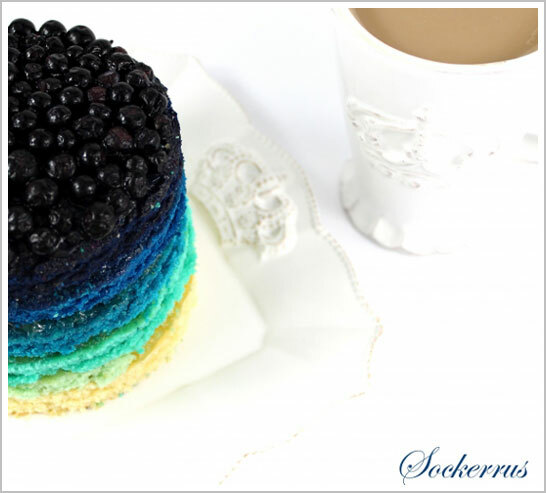 There might be six shades of blue in this cake, but it will make you feel anything but blue!! 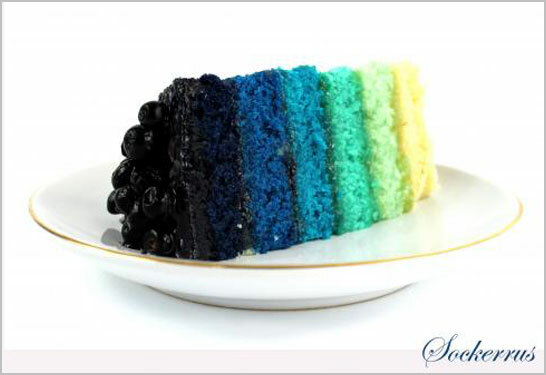 A very special thank you to Lisa Lundqvist of Sockerrus for sharing her Blueberry Rainbow Cake recipe with us today! Happy Baking!! In a large mixing bowl, combine flour, sugar, baking powder and salt. Add the soft butter and mix on low speed. Add 1/3 of the egg mixture and mix until well combined. Repeat twice. Place the layer who only had one tiny drop of color on a cake plate. Spread lemon curd with a spoon or small spatula over the first layer, make sure it’s well covered . Repeat process with the layer who hade two tiny drops of color and so on. Finish with a layer of lemon curd on the top and decorate with blueberries. I saw this on CakeCentral and I think it is so beautiful. Thank you for posting the recipe! I know I will be trying this one! Absolutely stunning!!!! Can’t wait to try my hand at this! Oh my blueberry heaven! This is just beautiful! Wow! That is one stunning cake!! Stunning! A must try! Thank you for sharing. Marvelous culinary creation. I admire the blue gradient – starting with deep tones ending with a lighter and hearty aqua. 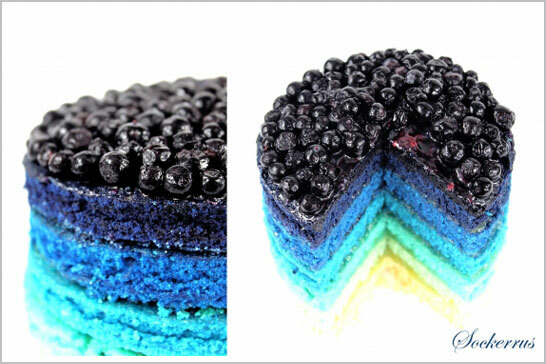 This takes the rainbow cake to a whole new level. I absolutely love the shades of blue, green, and yellow. It’s such an inspiration to try other color combinations too. This is just beautiful. You are very talented. Thank you for sharing your lovely photos. Gorgeous colors and gorgeous photos! And the lemon/blueberry combo sounds so delicious! Wow! I love the gradation of colors. You are an artist! I would love to make this! is there any way to change the recipe from grams to “cup” measurements? thanx so much! That is brilliant both in inspiration and to look at. Probably tastes brill too! I made this this evening and I used the same dye as you. I had a lot of difficulty obtaining the shades you did. I ended up using quite a bit of dye and the colours still arent matched. any pointers? Car – this cake and recipe was shared with us by Lisa Lundqvist of Sockerrus. So while I can’t speak to her recipe, I can say that blue is a hard color to tint. Whether it’s icing or cake! A rich blue can use a significant amount of food coloring. Also – I know Lisa used Wilton’s colors. I personally prefer Americolor gels. Here is a photo of the end result. As yo can see…a complete failure. It tasted delicious though. People at the party thought it looked spectacular, but they didnt have the original to compare it to. It was really hard to tint the cake especially because the gel-dye required a lot of stirring of the batter which caused the darker layers to fall flat. I used the same recipe and the two Wilton tints suggested. I did not tint the lemon curd, but I think they must have originally. This looks great. I would like to try it but I am just curious if I use frozen blueberries or fresh? Dear Lord! That is one beautiful cake! I’ve made rainbow cakes in the past – but now I might need to move to the next level with this thing! Thank you for sharing the wonderful recipe. It’s an absolutely gorgeous cake. So gonna try this.